This a pretty magnificent throne. At 35″ seats inside Singapore Airlines First Class Suites are some of the wider we’ve seen (not including my on-ground tour of the Etihad Residence). There’s enough floor space to give you plenty of stretch too. Wrapped in it’s own individual cabin you’ve got room to relax in luxurious privacy. Put your seat into relax mode and shut the doors if you want, but total privacy is best served for nap time. [cardboard id=”11964″]360° view inside Singapore Airlines First Class suites on the window. When it’s time to sleep, the process is more complicated than we thought. Instead of the seat itself unfolding, a team of flight attendants collapses your side console and seat then pulls out a fold-down bed from the cabin wall. The bed is already set up with luxurious linens to simplify turndown service. If you’re in a window seat, then you’re left with a cozy bed for naptime. In center seats you have the option of a double bed if the suite next to you isn’t taken. [cardboard id=”11963″]360° view. Singapore Airlines First Class Suites are equipped with beds separate from your seat. The luxury of Singapore Airlines First Class suites is enough to keep your senses alive but if you need a distraction, there’s wi-fi. It’s slow and expensive. In fact, it barely worked on this flight from Frankfurt to New York. I’m not sure how but it seems I maxed out my purchased plan (100mb, I think?) in no time. The upside is that your gear will charge faster while plugged into your nearby AC or USB outlets because you wont be surfing the web. Food is something I was really looking forward to in Singapore Airlines First Class Suites aboard the A380. 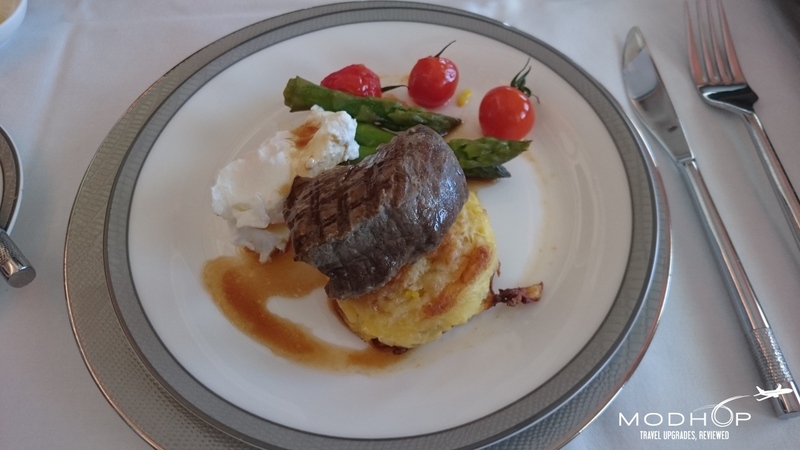 Brunch was the first meal on this morning flight so I chose a breakfast steak served after fruit and yogurt courses. I wasn’t wrong to go with the safe-bet steak and eggs but there were other tasty options that I’d go back for. On-board and advance order “Book the Cook” menus combine for a very nice variety of meal options. Brunch inside Singapore Airlines First Class Suites is top-notch. I used “Book the Cook” so I knew what was coming pre-arrival. If I didn’t know the work that goes into the Sinapore Airlines catering, I’d wonder how they made Lobster Thermidor this flavorful. 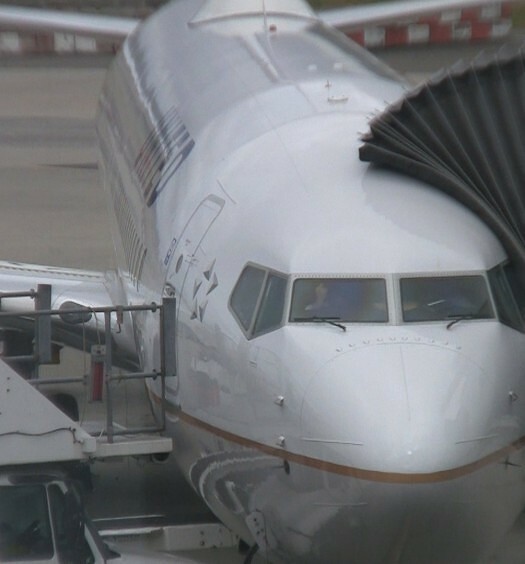 So even with the airlines attention to detail and advanced process, I’m a little amazed. The attention you get in Singapore Airlines First Class Suites is phenomenal so expect to be well cared for. Flight attendant Ernie was quick to notice the unusual number of pictures I was taking (with 3 different cameras) and offered help. I was grateful for the bonus souvenir photos before 8 hours of remarkable service from her and others in the Suites crew. From the glass of obligatory pre-flight Dom Perginon to team-dependent turndown service, all was handled with a cheerful elegance.. I got into this A380 Singapore Airlines First Class Suite by transferring Chase Ultimate Rewards points to a Singapore Krisflyer account. Points/Miles transfer 1:1. Saver awards can be difficult to find but we were able to waitlist one of these lower point redemption weeks in advance. Oddly, the waitlist never cleared but new saver availability popped up a day before the flight. Apparently, it pays to keep checking back. 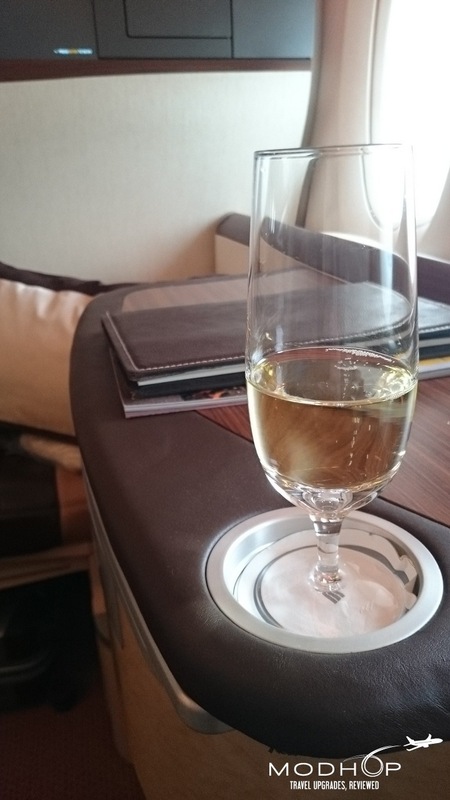 Thanks for reading our review of Singapore Airlines First Class Suites aboard the A380. See more reviews in our Seas section. 3 unBOXings of Delta Amenities… 2 are now obsolete.